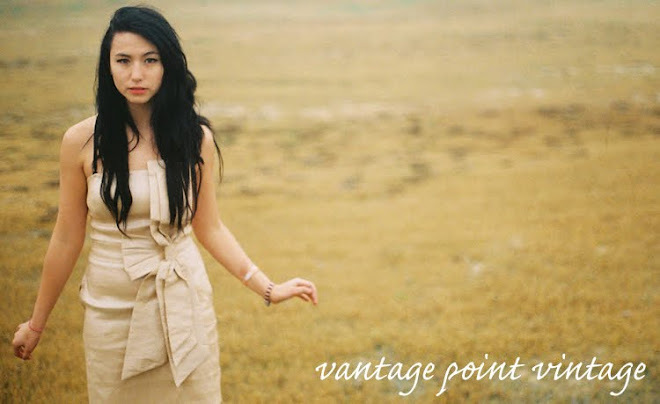 Vantage Point Vintage: Bundle Up! Well, here in the northeastern United States, the leaves are falling, the jack-o-lanterns are carved, and the days are getting shorter. This can only mean one thing: winter is just around the corner. While the thought that summer has packed her bags and headed to Oceania is depressing, there's no need to cry. Because winter fashion is oh so much fun! Hats! Mittens! Scarves and boots! Getting bundled up for the chilly winter weather looks so good! So how do you winterize your wardrobe? Are you all about the jacket, like Jennifer Aniston? Do you add a hat and boots, like Rachel Bilson? Are you a scarf girl, like Blake Lively? Or are you a little bit of everything, like Shenae Grimes? If you haven't got your winter coat yet, check out VPV's Outerwear. There are some great finds! Definitely a scarf girl a la Blake Lively. I have about 32940234 scarves shoved in my closet. Yayy for winter! It's still in the 90's here in Orlando though, so I love using scarves. Light weight, but still completely chic. Love the blog, dear. Ooooh, Jen Aniston is always so chic! Love them all but a little bit of everything is more my thing! Thanks for visiting! Your blog is amazing. We just love scarfs and jackets. And hats of course! i am all about the jacket like jennifer anniston! theres nothing like a good winter coat. Love all the looks, especially Shenae Grimes one!! !